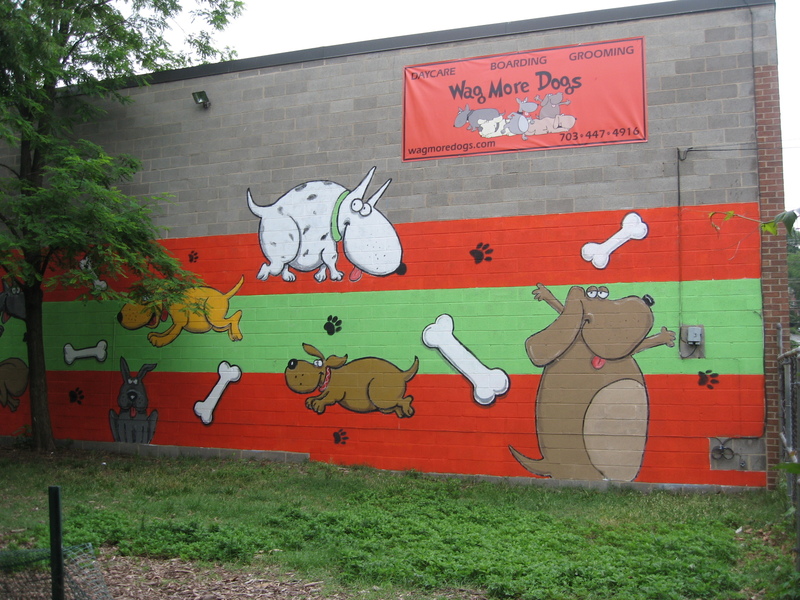 As reported in the ARLnow.com blog and in a Washington Post Local story, a federal appeals court has said Arlington County did not violate the free speech rights of the owner of Shirlington’s Wag More Dogs by blocking the business from displaying the mural painted on their building’s exterior wall. Back in August 2010 the Arlington County Zoning Office kept the new business from opening their doors until they covered the mural. They said the cartoon dogs cavorting on the building’s exterior wall constituted advertising, not art. There’s no word on what owner Kim Houghton plans to do next, but it seems that dog park patrons will have to suffer the now-tattered tarp eyesore for at least a while longer. It seems like a shame, when a colorful mural that mirrors the exuberance of the live dogs playing in the park every day is hidden beneath it.